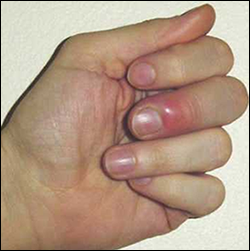 Herpetic whitlow is a contagious viral infection which is characterized by the appearance of small, painful blisters (lesion or whitlow) on the fingers/thumbs and the fleshy area around the fingertips. In some cases, the infection can also occur on the nail cuticles or on the toes. The occurrence of these blisters or sores is a result of direct contact with an infected blister/sore. Herpetic whitlow is caused by the herpes simplex virus (HSV) --- the virus which also causes cold sores and genital herpes. The condition, mostly caused by HSV-1, can affect children as well as adults. In case of children, the primary source of infection is the 'orofacial' area, with the infection usually getting transferred by the chewing, sucking, or cutting of the nails of fingers or thumbs. In adults, however, the main source of the infection is the 'genital' area, mostly with a corresponding prevalence of HSV-2. The infection in adults can predominantly affect certain professionals or adult health care workers -- chiefly medical or dental professionals -- because they can be increasingly exposed to HSV as they work closely with infected individuals. Swollen lymph nodes in the armpits or elbow area. There are some factors which can be potential triggers for the occurrence of Herpetic whitlow and other HSV infections. These factors include: fever or recurring illness, hormonal imbalance, excessive stress, surgery, excessive exposure to the sun, and mental, emotional or physical trauma. Herpetic whitlow is a self-limited illness. However, proper and timely treatment of the infection is very important, especially because unchecked occurrence of whitlows can potentially put a person at risk for Herpetic encephalitis -- a herpes infection in the brain -- and other superinfections or serious conditions. The treatment of Herpetic whitlow generally involves the use of antiviral medications. These medications -- prescribed as oral or intravenous treatments -- can effectively reduce the duration of symptoms in the primary infection as well as in recurrent infections. These tablets are considered an excellent herbal formulation for maintaining a healthy skin. The herbal components which are combined to prepare these tablets include: Kanchnaar (Bauhinia variegate), Guggulu Resin (Commiphora mukul), Haritaki (Terminalia chebula), Bibhitaki (Terminalia bellerica), Amalaki (Emblica officinalis), Ginger (Zingiber officinale), Black pepper (Piper nigrum), Pippali (Piper longum), and Varuna (Crataeva nurvala). The use of these tablets is very beneficial for people suffering from Herpetic whitlow because the herbal components of these tablets have proven abilities to treat skin diseases, and manage several other conditions. Dosage: 2 tablets with plain water, two times a day. 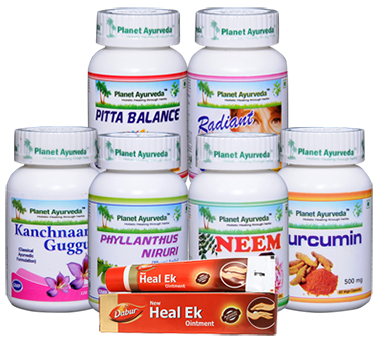 To prepare these capsules, the pure and standardized herbal extract of 'Bhumi amla' herb (Phyllanthus niruri) are used. The herb has known properties to support the immune system and maintain healthy skin because of its acrid, cooling, alexipharmic and diuretic actions. The use of these capsules is very beneficial for Herpetic whitlow patients because these capsules can purify the blood, and support skin health. Dosage: 2 capsules with plain water, three times a day. ‘Neem’ (Azadirachta Indica) is an excellent herb for managing skin disorders because it has the ability to keep the skin tissues healthy and maintain a healthy flow of blood in the body. People affected by Herpetic whitlow can benefit from the use of Neem capsules because they can be extremely helpful in improving the immune system, and managing a number of skin conditions, including dermatitis, warts, acne, itching, cold sores, eczema, dry skin, boils, psoriasis, wrinkles, skin rashes, and Scabies. Dosage: 2 capsules with plain water, two times a day. (These capsules can also be opened to make a paste by mixing with 1 teaspoonful of water. The paste can be applied externally on the blisters). These capsules are prepared from Curcumin which is one of the main active compounds of the rhizomatous herb of Turmeric (Curcuma Longa). The standardized extract of turmeric is used for preparing these capsules which can ensure the health of skin tissues, enhance the body's immunity, and have beneficial antioxidant and anti-inflammatory actions. The use of Curcumin capsules is beneficial in managing the symptoms of Herpetic whitlow because of their ability to reduce inflammation, treat nerve pain, manage swelling, and treat different types of allergies. Dosage: 2 capsules with plain water, times a day. These capsules are prepared from some excellent herbal ingredients which comprise cooling compounds and natural calcium compounds, including Praval Pishti (Coral Calcium), Akik Pishti (Agate Calcium), Mukta Pishti (Pearl Calcium), Jawar Mohra Pishti (an Ayurvedic Calcium compound), Kamdhudha Ras (an Ayurvedic Calcium compound), and Giloy satva (extract of Tinospora cordifolia). These capsules can relieve the symptoms of Herpetic whitlow because they can balance the body's Pitta dosha, keep the skin healthy, promote the functioning of the immune system, purify the blood, and treat several other conditions. Dosage: 1 capsule with plain water, two times a day. This amazing herbal formulation -- available in capsule form -- can support and maintain the healthy skin tissues because of its potent herbal components including Manjistha (Rubia cordifolia), Chirata (Swertia chiretta), Pit papda (Fumaria officianalis), and Grit kumari (Aloe barbadensis). People suffering from Herpetic whitlow can benefit from this formulation because its herbal components have proven ability to improve skin health; make the skin firm, smooth and elastic; and treat acne, ringworm, pimples, and psoriasis. Dosage: 2 capsules with plain water, two times a day. This ointment, for local application, is made from a combination of herbal ingredients which are known for their ability to maintain a healthy skin. This ointment specifically has broad spectrum antibacterial properties. The application of this ointment on affected skin can manage Herpetic whitlow due to its proven antibacterial actions even in the presence of blood, pus and other organic matter; and reduce associated local pain and wound odour. Application: The ointment should be applied locally on the infected skin area. 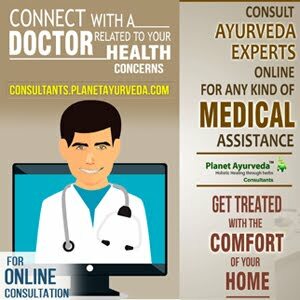 These herbal products for managing Herpetic whitlow are pure vegetarian products formulated by M.D Ayurveda experts. These products do not contain any chemicals, additives, preservatives, yeast, starch, extra colors, fillers or binders.